So I’ve always really loved my slow cooker. Always. But now, I really, really, really love my slow cooker. Without it, we would be eating cereal, ice cream, and peppermint patties for dinner. Which was ok while I was pregnant (I DID throw in some prenatal vitamins, ok?) but not so much anymore. At some point, I’d like not to LOOK pregnant anymore. This dish is a 7AM, pre-work, post-feeding baby creation. As in, what do we already have that I can throw in the slow cooker, get dressed, get baby ready, go to work, come home, feed baby, and then feed Husband and me? This, is turns out. Dump everything in the crockpot. That’s right. No pre-seasong, no pre-searing, just straight into the crockpot. Cover and cook on low for 7-8 hours. 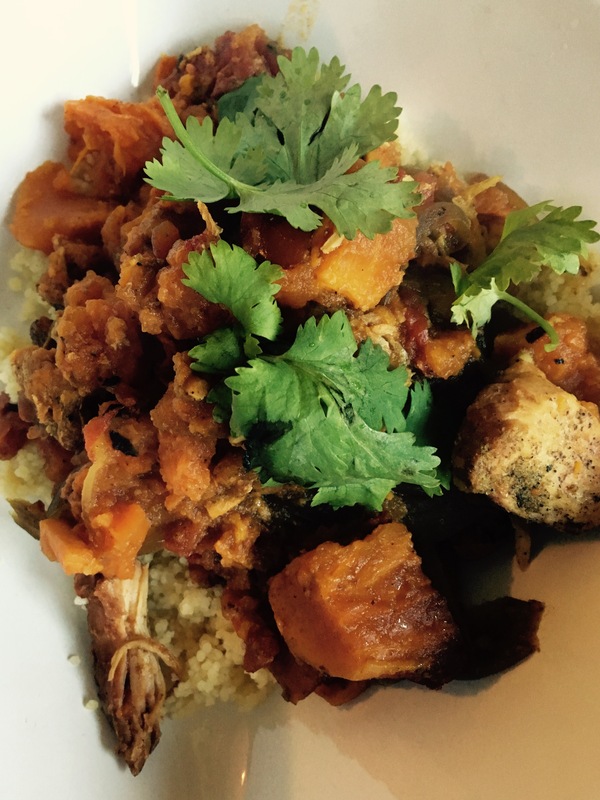 Serve over couscous (takes less than 2 minutes to cook! amazing!). I was surprised by how delicious this was, given the haphazard way it came together. Hence, why I’m sharing it here with you. Huge bonus: it makes enough so that you don’t have to worry about dinner the following night. It does make me wonder, though – what do normal, non-cereal eating working-outside-of-the-house people make for dinner!? Please (please) enlighten me. A few weeks ago our dishwasher stopped working. This was not a big surprise; the appliances in our kitchen are all from the late 1970s, early 1980s if you’re feeling generous. The joys of renting an apartment is that you can know nothing about dishwashers, and yet, they still somehow magically get fixed. Except in this case, we now have a new fridge and a new stove, but our dishwasher is still sad and broken. On the bright side, when we cleaned out the fridge, we also tackled the cabinets. I found a bag of red lentils my mom bought when the baby was first born. I also found a green curry paste that went bad in May 2013. Do lentils + curry = dinner? Though the can of paste went in the garbage, we dined on this delicious concoction last night. In a large skillet, heat the coconut oil over a medium heat and add onions. Saute about 4-5 minutes, and add garlic and ginger. Cook until everything is nice and soft. Add the lentils, coconut milk, stock and basil. Turn the heat down and simmer for about 20 minutes, stirring occasionally. Add the spinach and fold in gently, letting it wilt. Add lime juice and adjust seasoning to taste. Serve with rice or naan, and a dollop of Greek yogurt. Top with a bit of green onion for a nice finish. The answer to the question above is a resounding yes. This is so, so good. Even better, it’s healthy (I think). Best of all, this cooks itself in about 25 minutes, total. That includes the time to cut your veggies and mince your garlic. Yes. Of course, the one downside to the beautiful change in seasons is the slow creep away from those hearty, soul-filling foods. When my sister visited a few weeks ago (how surreal is this: the LAST time I will see her before I become a MOM), we spent almost a full day planning out a menu (clearly, we’re sisters, and daughters of our mom), and took full advantage of one of the last cold blasts of the winter season. OK, now I’m really ready for summer. Wash the lentils, and then, in a large bowl, cover them with boiling water. Allow them to sit for about 15 minutes. Drain. In a large pot over medium heat, heat olive oil and then saute onions. After a minute or two, add the leeks, the garlic, salt, pepper, red hots, thyme and cumin, and cook for about 15-20 minutes. Add celery and carrots; saute another 10 minutes. Add chicken stock, tomato paste, and drained lentils. Cover and bring to a boil, and then reduce the heat and simmer (uncovered) for about an hour – until the lentils are completely cooked through. Add kielbasa, red wine, and simmer until the kielbasa is hot. Adjust seasonings – and serve with your choice of topping. As you can imagine, this soup gets even better when it sits overnight, soaking up all the goodness. If it’s not spring/summer yet where you live – make this. It will NOT disappoint. There’s nothing I don’t love about Mexican food. Onions? Check. Cilantro? Check. Heat? Check. Crispy, fried corn chips? Check. Melted, delicious dairy? Yes, please. Something you can make with veggies or with meat, so Husband doesn’t complain about wasting away? YUP. 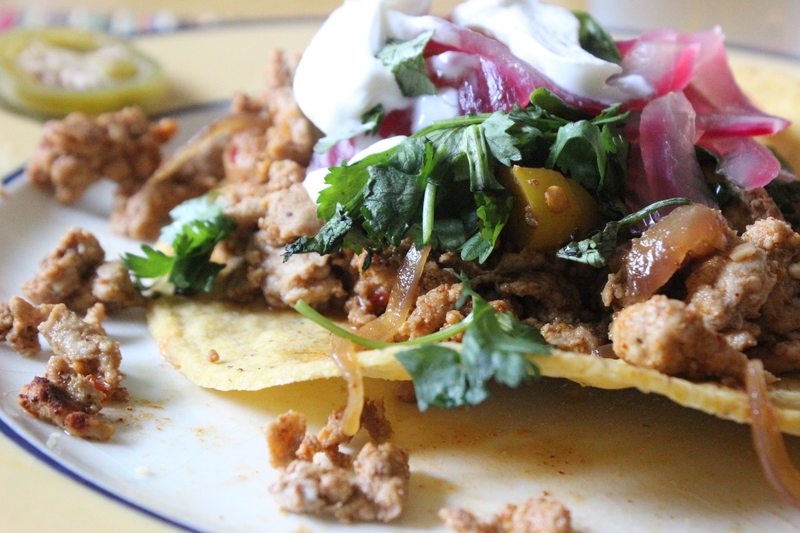 Because we tend to have Mexican food fairly often, I keep a lookout for interesting twists. This quick-pickling innovation, from Cooking Light, really is as good (and as quick) as it sounds. Reduce the amount of jalapeño if heat isn’t your thing. But seriously, make these. Combine 1/2 of your sliced onion, vinegar, water, a little bit of sugar, about 1/4 teaspoon salt, and the jalapeño in a small saucepan over high heat. Bring to a simmer and cook for a minute. Remove from heat and place to the side while you make the rest of your meal. In a large skillet over medium heat, heat olive oil and add the other half of the onion, along with bell pepper. Cook down about 5 minutes, and then add ground turkey and garlic. Break the turkey up and add all of the spices. Cook 5-7 minutes, or until browned. Drain pickled veggie mixture. 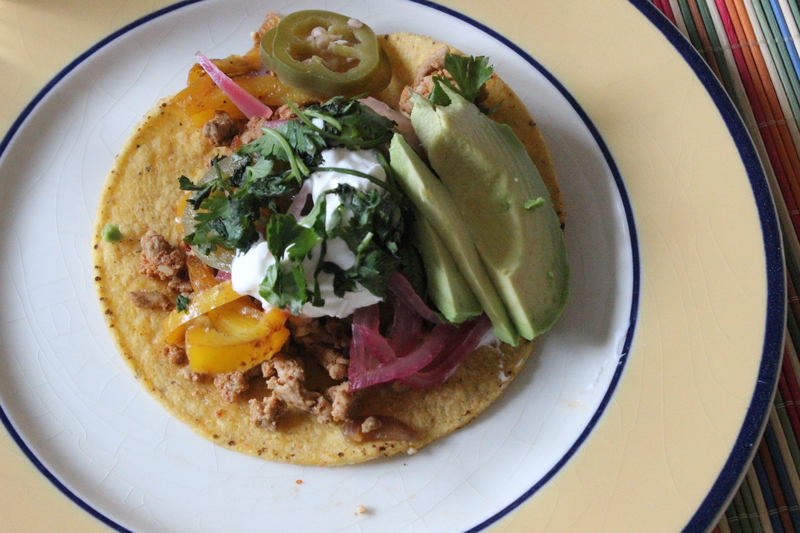 Top tostadas evenly with the ground turkey, pickled onions and jalapeños, a bit of sour cream, avocado, cilantro – whatever makes your heart sing. While lamenting the effectiveness of the tostada as a food delivery system, Husband agrees: we should pickle more vegetables, more often.